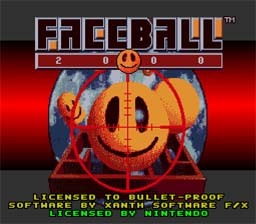 You are about to enter FaceBall 2000 where you may compete with a friend one- on-one in the Arena, or tackle the ever more difficult challenges of the CyberZone. In CyberZone, thc object is quite simple: defeat the Master Smiloid and become the new CyberZone Champion. To do this, you must make your way through 41 challenging levels filled with Power-Ups and hostile Smiloids. In the Arena, play a computerized version of tag. The first player to get ten "tags" is the winner, at least until the next match begins. You may also try your hand (or face) against a selection of Smiloids. One or two players may play free-for-all or on a team. --From the SNES Faceball 2000 instruction manual.